Only 3 more weekdays before I return to work. I have really enjoyed spending this time with my mother. We have had lots of laughs and a few tears. She has had time to relax , catch up on her rest, and even read. We had a great dinner tonight of 16-bean soup simmered for hours with the Thanksgiving ham bone – yummy! Well, let’s look at the last of the projects for the Christmas Celebrations. Deb was over today and has cut all the paper that can be precut. We will be available to cut the paper you choose to use for the gift box and the telescoping card. 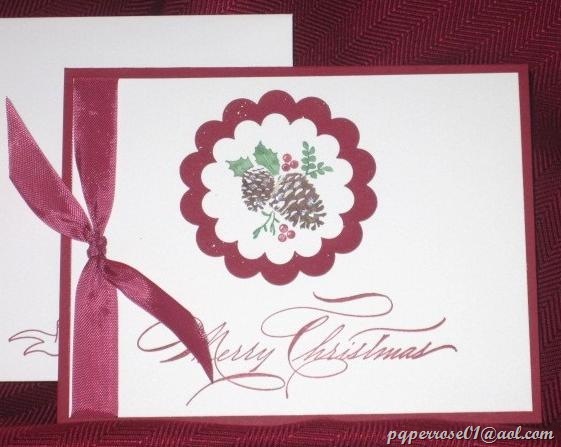 “Pines and Poinsettias” is a very simple card with a Cherry Cobbler and Whisper White color scheme. We colored the stamp with Chocolate Chip, Garden Green and Cherry Cobbler markers and used scallop circle punches to highlight this simple stamp. I added Dazzling Diamonds glitter to the pine cone and used “home brew” on the cobble scallop circle, but this added sparkle is really not needed. 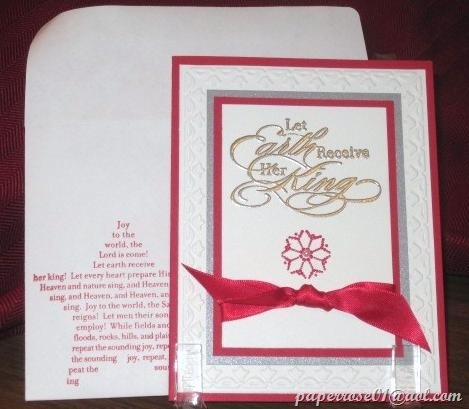 The beautiful “Hand Penned Holidays” message is elegant and adds to the simplicity of the card. Finally, a bit of Cherry Cobbler ribbon provides extra soft color. I love this next card – perfect for the young at heart. I cas’d this from a swap with my demonstrator stamp group, but made slight changes. 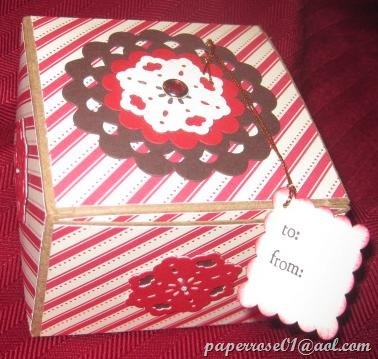 I added more red ribbon, a bow, and used different patterns of designer paper for the squares. The snowman and left reindeer are from an old retired set that I cannot bear to part with. 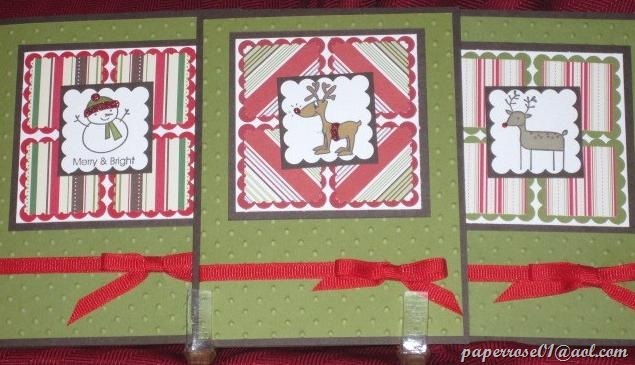 The reindeer in the center is from Clip Art and has been sized to fit in the scallop square. I have 2 reindeer from Clip Art that I have printed up so you will have a choice of 4 holiday features as well as you choice of designer paper. 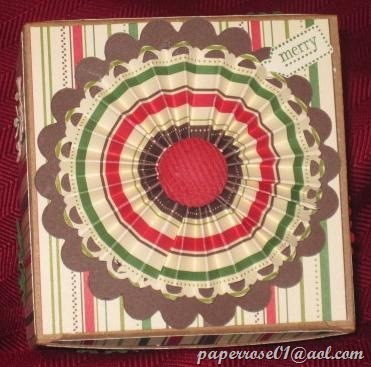 Punches are used for the scallop squares and the designer paper. Red stickles adds a bit of sparkle. Now for a bit of telescoping fun. These are 3-part circular cards with 3 different sized pages held together by brads which allow them to rotate. I have 2 samples to share below and a 3rd drying. Give some thought to your telescoping card and feel free to bring a special stamp of paper if you have something you would like to use. The view to the left is a top view of the card which features a lolly, and the view above is a side view. As the card telescopes, we can see the 2nd page rotate out above, and the full 3-page card to the right. I featured snowflakes on the lolly, punched snowflakes added to the designer paper on the 2nd page, and a stamped snowflake with rhinestone on the 3rd part of the card. I love how it telescopes up to one circular design. The next card features ornaments. I find it easier to work with a theme, but that is my personal preference and it not necessary. You can see my red and white Lolly featuring an ornament on top. 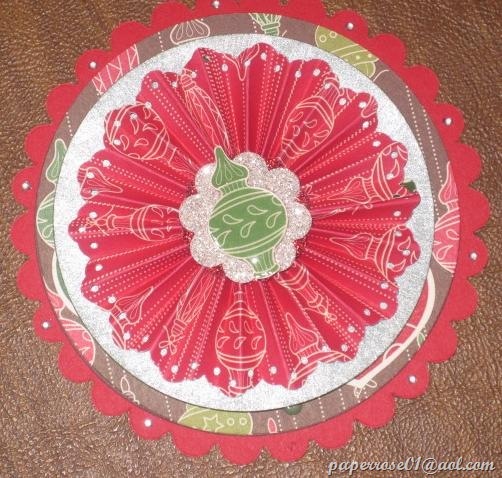 You can also see the second page (brown designer paper) and the third page – a red scallop with tiny rhinestones. The view on the left shows the card as it starts to telescope out. The view on the right shows the card fully opened. If you look closely, you will see that the designer paper I used on the second page is upside down. When you attach a top page to a bottom page, the top page must lay over the bottom page upside down. I guess I didn’t read my own directions for this card! I stamped ornaments that matched my designer paper on the third page and added several small rhinestones for some sparkle. Telescoping cards are very different but are perfect for a hostess gift or for that special friend. 6-year old Granddaughter Jailyn was over tonight examining the cards and commented that these cards could hang from a tree, from the Christmas stocking hooks, or even from a tablecloth. She gave a demonstration on how the cards would look hanging in these places. So perhaps a bit of cording added to the top card would be useful. Deb and I are looking forward to seeing you this weekend at the Christmas Celebrations Stamp Camp. 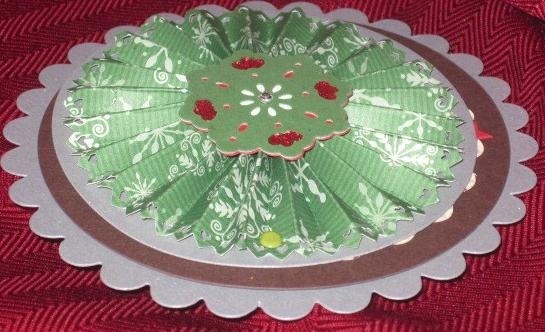 We will have the designer paper out for the gift boxes and telescoping cards and will cut the paper you choose. We will have fun and I promise not to sing Christmas carols and the CD player is broken. Even the CD player on my computer is not working! BUMMER! No Christmas music! Oh well, we can laugh and share our holiday woes and triumphs. If you think you will be coming to Christmas Celebrations, it would be helpful if you drop a note as this helps us in cutting paper and preparing packets. Friday Dec 2nd, 3 PM to 9 PM, and Saturday Dec 3rd, 9 AM to 4 PM. Let me know if you need to come earlier on Friday Dec 2nd. The cost is $11 and all paper and supplies are provided. Give me a call if you have any questions. Rosemary – 630-759-3089 or paperrose01@aol.com. p.s. Mark your calendars now for our first 2012 stamp camp – January 6 and 7. This will be low key, easy peasy, only 1 new technique and will feature winter! We will only do 3 or 4 cards, but we have to keep our creative forces in gear after the holidays! Were you wondering if the Christmas Celebrations Stamp Camp was really going to happen? Did my creative juices start flowing to come up with some cool ideas? Well, the answer is yes and yes. The projects are 99.9% complete. I’m waiting for my red Stickles holly berries to dry to finish my last box and we will be ready. 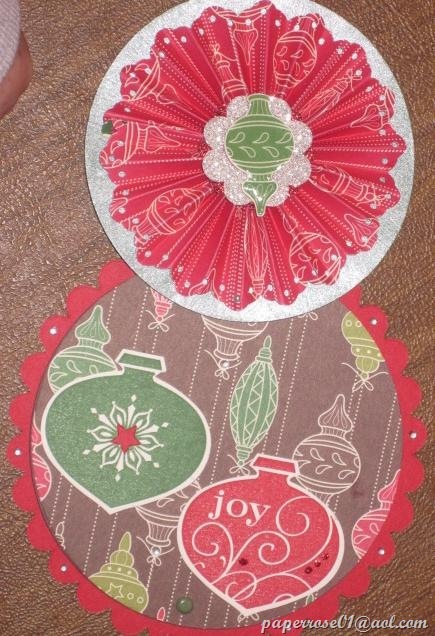 “The Sounding Joy” is one of the projects we will be completing at our Dec 2 & 3rd Christmas Celebrations Stamp Camp. The color combination of red, white and brushed silver with pewter embossing is absolutely stunning. However, I must admit there will be a slight change from the picture. When I reached for the red satin ribbon this evening, I discovered it was red grosgrain and the red satin is empty. We will improvise! 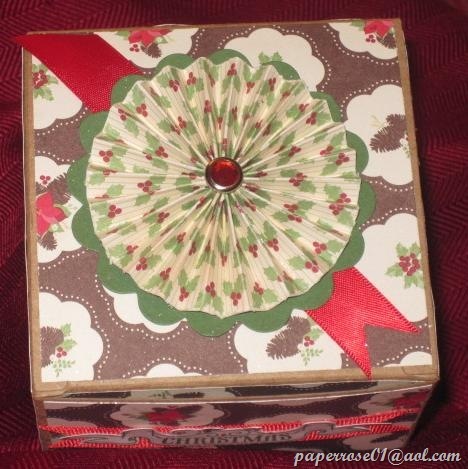 We will each be accessorizing a Stampin Up Kraft gift box as one of our projects. I have completed 3 samples, but you can create yours however you wish. We will use 5 pieces of decorator paper – your choice. I added a top accessory – some simple and some not so simple. 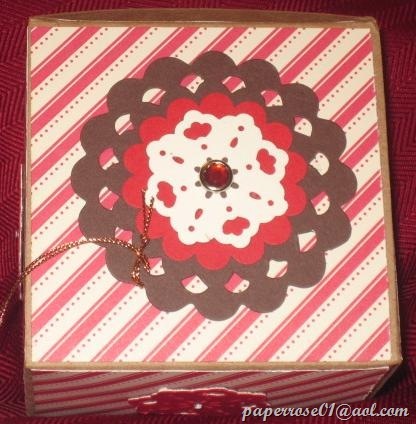 The red and white gift box below needed a third color so I chose to work chocolate chip into my design. As you can see, the top is just a die with several punches and a red rhinestone brad. The sides are embellished with the 3-way snowflake punch in Chocolate Chip, Real Red, and Very Vanilla. A tiny rhinestone adds a bit of bling to the center of each snowflake. This next gift box I titled my Christmas Box. Although you can’t tell, I sprayed the designer paper with home brew to add sparkle. This was where I discovered there was no more red satin! 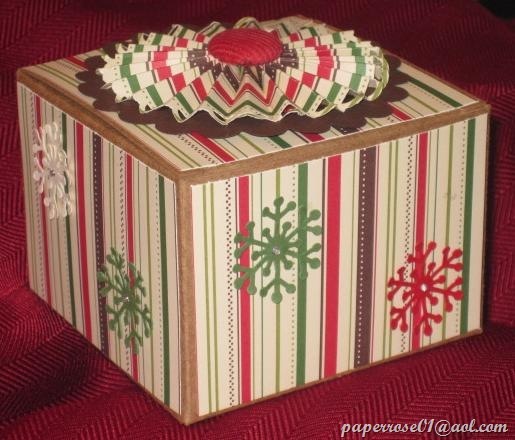 You can see the red satin ribbon on the top and red grosgrain on the front panel I embellished this box with a lolly (aka medallion) made from the opposite side of the paper used to cover the box. 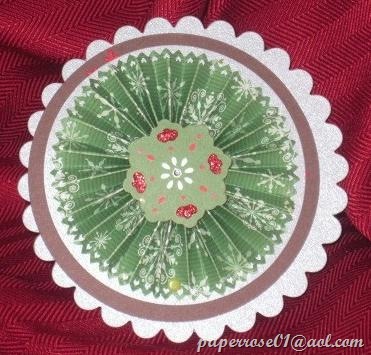 I have stamped some little holly leaves from the “Pines and Poinsettias: stamp set, and used Stickles to brighten the holly berries. 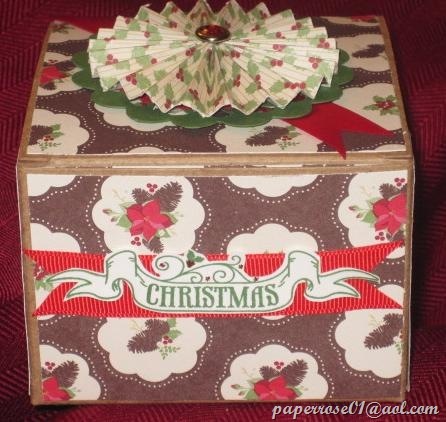 When they are dry, I will cut them out and use them to accessorize the sides and back of my Christmas Box. So what else will we be doing at the Christmas Celebrations Stamp Camp? The remaining 3 projects will be posted tomorrow. 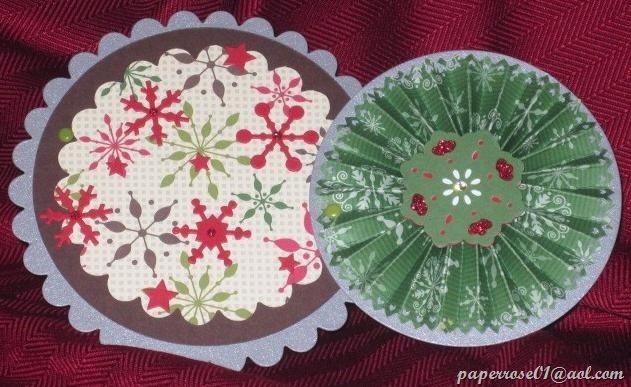 We will be making a cherry cobbler and white card featuring the “Pines and Poinsettias” stamp set. This is a simple card but quite stunning in its simplicity. We will also be doing a fun card in Old Olive, Real Red and Early Espresso featuring your choice of a reindeer with a sparkly nose or a snowman with a sparkly hat . Our final project is a telescoping card with a lolly on the front. Andrea, a Saturday stamper, recently brought a telescoping card she had made at a craft fair, If you have never made a lolly (aka medallion) before, this is a great time to learn. Judy, a Friday stamper, demonstrated lolly-making several months ago, but I don’t remember who was in attendance at the time. Basically, you take a strip of 12” paper and score the long side every 1/4”. This is where a scoring board comes in handy although you can use the scoring tool on your paper cutter. I’ve tried scoring every 1/4” going down the length of the paper; I’ve also tried scoring every 1/2”, then flipping the paper and scoring every 1/2” but starting at 1/4”, 3/4”, 1 1/4”, 1 3/4”, etc. The latter actually goes faster for me. I know it sounds like a lot of work, but it goes quickly and is really a lot of fun, especially when you see the finished result. You can also create a lolly from a large circle by scoring around the circle, but I haven’t tackled that method yet. Simplicity in gold and white! That’s what this card says to me. Deb created this card using brushed gold and Whisper White card stock. 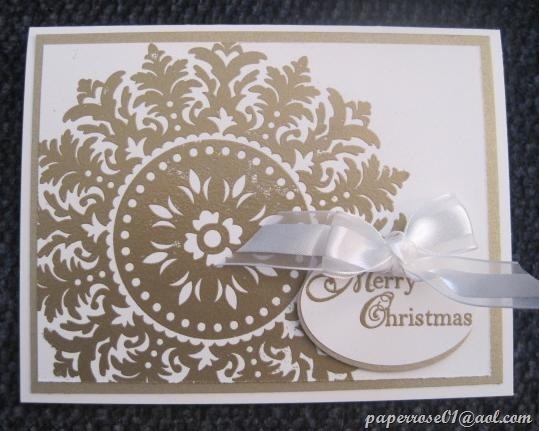 She embossed the “Medallion” stamp image with gold embossing powder, added a simple gold embossed “Merry Christmas tag and a white bow. Simplicity! 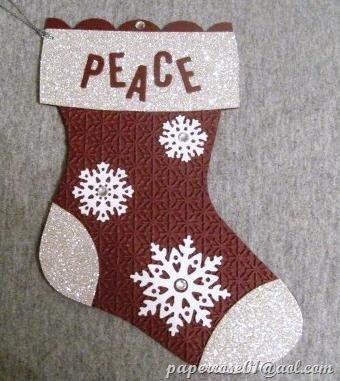 This is my “Peace” stocking. Granddaughter Jailyn says she likes the stocking but doesn’t like the color. I, on the other hand, find the silver glimmer paper very striking with the burgundy. I added a scallop border to this simple stocking along with 3 die cut snowflakes that feature rhinestones centers. The embossing folder used with this stocking is the new Snow Burst folder (Holiday Mini, p.33). The embossing impression is deep and really changes the texture of the paper. 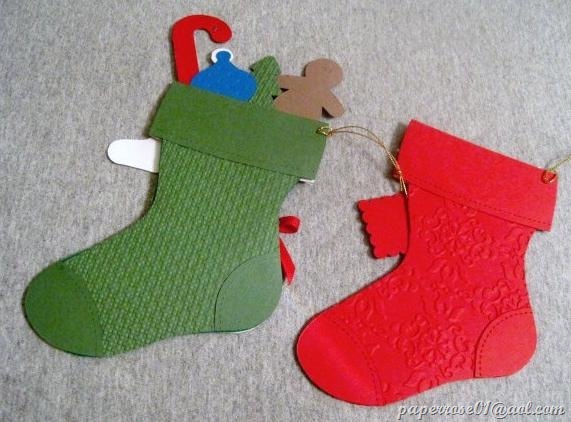 When we cut a stocking, we will cut two so that we have a front as well as a back. If we are embossing, we will make sure each side is embossed in the correct direction. This gives a finished appearance! The final stocking for today is one I created for my 93-year old Mother who is visiting from California. Note that I used a real red stocking embossed in Vintage Wallpaper. The trim is Holly Berry Bouquet. 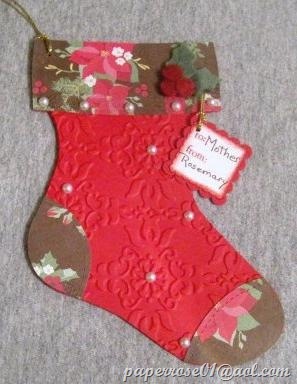 The stocking is decorated simply with pearls and in the upper right hand corner, a stitched felt holly cluster. This is my Victorian stocking.